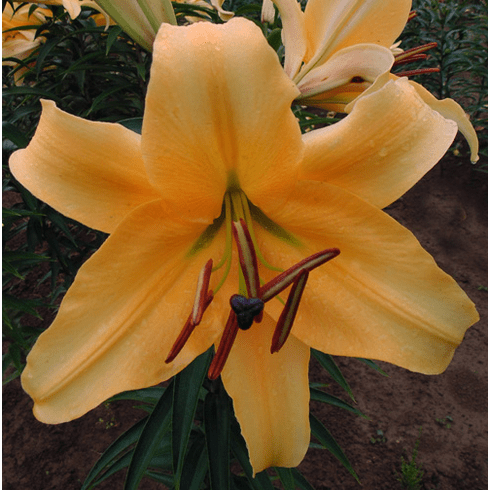 Named for the famous hill in Rio de Janeiro atop which stands the symbol of Rio, the 125 ft. 'Cristo Redentor', 'Corcovado' 'the lily' will become just as familiar a landmark in your garden. In the same color family as our ever popular 'Eudoxia' and 'Saltarello', (neither of which are not available this season) the three together in our gardens are a beautiful sight to behold. Classified as an orange, we see it more as an apricot blend. Flowers in early August Flowering. 3 to 4+ Feet. Fragrant.